Rachel Balkovec joins the Astros for her first season as Latin American Strength and Conditioning Coordinator after spending the last two years with the Cardinals as the club’s minor league strength and conditioning coordinator. 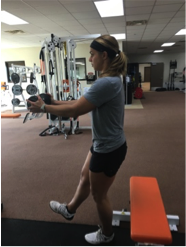 Prior to her time with St. Louis, Balkovec spent the 2013-14 offseason as a strength and conditioning coach with the Chicago White Sox. She is the first female strength and conditioning coach in the history of professional baseball. Balkovec began her career in pro baseball with a stint as a minor league strength and conditioning coach with the Cardinals in 2012. She then went to work in marketing and promotions for Los Tigres del Licey of the Dominican Winter League, before serving as a strength and conditioning coach with the Arizona Fall League. Balkovec also served a stint as a volunteer assistant strength and conditioning coach with Arizona State University. Balkovec graduated from the University of New Mexico in 2009 with a bachelor’s degree in Kinesiology and Exercise Science. She was also a softball catcher for the Lobos. She received her Master’s degree in Sports Administration from Louisiana State University, where she also served as a graduate assistant strength and conditioning coach. Rachel has recently began reaching out to the community in efforts to lift other young female athletes and inspire them to live fearlessly. She has started a public speaking initiative directed at the empowerment of young women through sharing her story of gender discrimination, unparalleled resilience and redefining success. I have made a huge mistake in the past in giving weekend warriors a workout routine without doing the most basic thing of all: a movement screen. When Tim mentioned the possibility of me writing a guest post, I immediately went into programming mode. 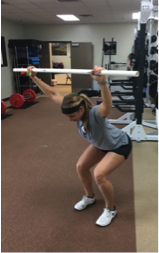 I thought, ‘Okay, they need to know that they should be squatting and pulling from the floor!’ However, there is something you need to know about ‘training like the pros.’ You need to know how to move first. The truth is, you should only be doing loaded movements like a squat and deadlift IF you can move correctly while doing them. And that is a HUGE if. Here are some common questions about the importance of movement and how to correct it. Q: Why is movement so important? A: In the past decade, there has been a huge shift in the way we evaluate our athletes at the collegiate and professional ranks. Elite athletes don’t always move as well as you’d think. Trust me, some of the professional athletes that we work with every day have just as much back pain and immobility as you do. The difference is, they can throw a ball about 30mph faster than you can with laser precision and their shooting percentage easily puts yours to shame. While they are skilled athletes in their sport, they may not always be skilled movers. We still evaluate their athletic and physical capabilities through performance testing. However, there has been an important component added to the arsenal of tests that we do. Almost every college and professional organization has started doing some sort of movement screen to determine an athletes’ ability to move pain free through a full range of motion. Before we even think about writing a program for an athlete, we screen their movement abilities. No matter how strong or explosive an athlete is, their movement will determine their ability to stay healthy and stay on the court/field. If they do not have proper mobility and stability, none of the strength training that we do will help them. Q: What is the definition of good movement? A: It’s important to define good movement and explore the reasons why we lose it over time before we delve into the screen. Think about the movement capabilities and flexibility that you had when you were five years old. You could go into full depth squat to pick up something heavy without worrying about throwing out your back or tweaking your knee. You could run around in the back yard playing tag for hours without worrying about tearing your ACL. You could jump off of a tall fence after being chased by a dog and not worry about what’s going to happen when you land. That is good movement. Q: Why do we lose the ability to move? A: There is a common misconception of why we lose this as we age. At the young age of 28 I’m hearing my friends start to say, “I’m getting old, my back is starting to hurt.” That is a flawed philosophy. Over time, we (humans) stop moving as much and we definitely stop moving like we did when we were children. We go to work all day and sit at a desk, then we go to the gym and walk around like zombies doing single joint movements and using dumbbells because barbells are ‘dangerous.’ Lastly, we finish up with a little bike ride, further solidifying the sitting pattern that we are in all day at work. If and when we decide to play a game of pick up basketball on the weekend, we then wonder why our hips and knees hurt for days afterward. It’s not because you’re old, it’s because you don’t move enough. You didn’t lose that mobility and child like athleticism because of your age. You lost it because of your lifestyle. Now that we have defined good movement and talked about the reasons why we lose it, let’s talk about evaluation and correction. Q: How can I evaluate my own movement? 1. Am I ready to load upper body movements? Place your back on the wall with your feet 2 feet away from a wall. Eliminate the lumbar curve in your back completely by tucking your glutes/hips underneath of you and pushing your low back against the wall. This ensures that you are keeping your ribcage down while performing the movement instead of seeking the mobility from your spine. Place a towel behind your head and maintain the towel on the wall throughout the movement. Pinch a broomstick/dowel between your thumb and your hand at shoulder width apart and lift your hands up over head maintaining straight arms. 2. Am I ready to load lower body movements? Start with your feet shoulder width apart and toes pointing straight ahead. Grab the broomstick/dowel and put it on top of your head. Bend your elbows to 90 degrees to ensure that you are measuring your grip consistently. Straighten your arms above your head and sink into a squat. 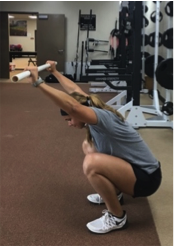 If you cannot touch your thumbs to the wall on the first test, chances are you won’t be able to perform this squat with your arms overhead. If you found this to be true, then try the regular squat version with your hands behind your head. If you have any pain with the movement or you cannot get to quad parallel with an upright torso, (as seen in the 3rd picture), you very likely have a lower body immobility issue or an acute injury and should not be loading the movement. 3. How do I fix my shoulder mobility? There are COUNTLESS exercises to help improve these movements: these are just a few of many exercises that I would recommend. 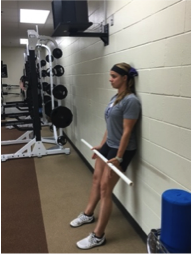 Sit back to the wall with flexed knees to ensure that your low back is flush on the wall. Place a towel behind your head. Tuck your chin and push against the wall to engage deep neck flexors. Externally rotate at the shoulder to a comfortable place. Flex at the shoulder while keeping your back flat against the wall and your ribcage down. Only lift your arms as high as you can while keeping your thoracic spine (mid back) completely against the wall. Engage your mid back muscles making sure to maintain the space between your ears and shoulders. Start with your elbows on the bench with a neutral spine. Sit your hips to your heels, bending your elbows. Maintain a neutral spine, be careful not to extend or flex the spine through the movement (as seen in the 3rd picture). Lay on the foam roll with your low back completely flat and a small towel beneath your head. Tuck your chin and squeeze your gluts to ensure that your ribcage stays down your pelvis stays in a neutral position. Raise your arms overhead, making sure to maintain contact of your low back with the foam roll. This is to ensure that you are creating the movement in your shoulder joint and not from your spine. 4. How do I fix my squat? Start approximately 2 feet away from the wall. This will vary depending on your skill level. Out of the bottom of the squat, drive through the mid foot while actively thinking about engaging the hamstrings and gluts. Measure out your elbows to 90 degrees just like you did in the assessment and lift your hands overhead. Keep your ribcage down and sit back towards the wall. Only use the wall as needed to spot you while you are trying to maintain an upright torso. Once you have reached quad parallel, drive through the mid-foot and return to standing while actively engaging the gluts and hamstrings. Begin standing on 1 leg about 6 inches from a bench. Put a 10lb weight in your hands and straighten your arms to help counterbalance your hips sitting back to the bench. DO NOT plop on the bench. Touch and go, driving through the mid-foot and actively engaging the hamstrings and gluts.